RadTimePicker control allows the end user to enter a time value to the editable area of the control, or pick the time from the drop down by selecting both the hours and the minutes. 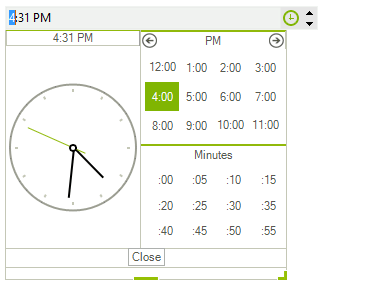 The drop down by default contains RadClock on the left side and two tables on the right side – for picking hours and minutes respectively. The control has null value support, 12 and 24-hour time formats according to the culture, allows formatting and customization.